^ PROTOCOL TO THE TREATY BETWEEN THE UNITED STATES OF AMERICA AND THE UNION OF SOVIET SOCIALIST REPUBLICS ON THE LIMITATION OF STRATEGIC OFFENSIVE ARMS, TOGETHER WITH AGREED STATEMENTS AND COMMON UNDERSTANDINGS REGARDING THE PROTOCOL. [2011-11-06]. （原始内容存档于2011-07-10）. ^ STATEMENT OF DATA ON THE NUMBERS OF STRATEGIC OFFENSIVE ARMS AS OF THE DATE OF SIGNATURE OF THE TREATY. [2011-11-06]. （原始内容存档于2011-07-10）. 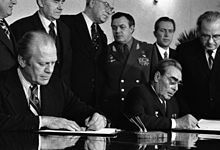 ^ MEMORANDUM OF UNDERSTANDING BETWEEN THE UNITED STATES OF AMERICA AND THE UNION OF SOVIET SOCIALIST REPUBLICS REGARDING THE ESTABLISHMENT OF A DATA BASE ON THE NUMBERS OF STRATEGIC OFFENSIVE ARMS. [2011-11-06]. （原始内容存档于2011-07-10）. ^ SOVIET BACKFIRE STATEMENT. [2011-11-06]. （原始内容存档于2011-07-10）.